HISTORY : This temple is one of the few places of worship in the world that had withstood the vicissitudes of historical events that occurred around its location over some millennia in the past. Further, very probably, this is the most ancient of the places of worship in the whole of Sri Lanka. It was originally established some thousands of years ago by the Nagas (Serpent/Dragon race of people) who were a branch of a pre-historic, probably Dravidian, race which colonized South India and Ceylon, as a place of worship for the Naga god (Serpent-God) known to the Tamils as “Naga-Nayinar” or simply as “Nayinar”. Hence the name “Nayinar-Theevu” (the island of the Serpent-God) which now stands corrupted and spelt as “Nainativu”. There is an age-old custom prevalent even to this day, among the Thol-Thamilar (people of the Valluvar community in this case) of Nainativu, to refer to people, whom they need to show respect to, as “Nayinar” (for males) and “Naachchiyar” for females. “Nayinar” as we have already seen, means “the Serpent-God”. “Naachchiyar” would appear to be a corruption of “Naga-Aachchiyar”, which means “Goddess Naga”. This custom among the Valluvars is clear evidence that they have remained very closely connected to Naga worship until recently. Further, there is evidence to show that until less than a century ago, most Valluvars of Nainativu, lived in the vicinity of the Nainativu Nagapooshani Amman Temple. There are many plots of land, bearing the name “Paraiyan Kudiyiruppu”, close to the temple, that no longer belong to people of that community. Their ancestors may have been direct descendants of the pre-historic Dravidian Nagas. It is clear that it was the Valluvars (after the Nagas) who maintained the traditional serpent worship at Nainativu, for at least some centuries, until it finally gave way to Hindu & Buddhist religious influence and political influence from outside Nainativu, and merged with both the worship of Shakthi, and the worship of Lord Buddha. Even for many centuries after this temple began to operate as a Hindu temple, there is no evidence of Brahmin-priests being employed to officiate at this temple until in the middle part of the nineteenth century (circa 1856) when two brahmins were appointed here to work as priests. For many centuries before that, it was local non-brahmin Tamils who functioned as priests at this temple. 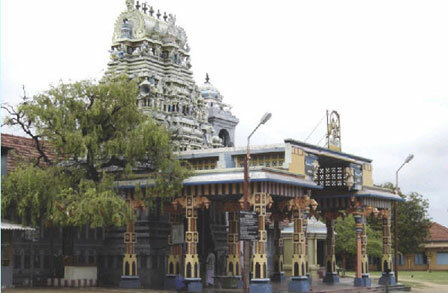 Although this temple is considered to be one of the 64 Shakthi Peedams (or the Great Seats of Shakthi, the consort of Siva) of the Hindus that exist all over the world, there exists to this day in the karu-arai (or sanctum sanctorum) of the temple, a carved stone figure of the five-headed King Cobra (“Nayinar” or the Serpent-God) that had been (and that still is) the object of worship for some thousands of years. Shakthi at this temple is called Naga-Pooshani (the Lady who is worshiped by the Serpent). Credit that belongs rightfully to the Tthol-Thamilar (Valluvar) people, must be given to them for securing the retention of Naga worship in this way, alongside the worship of Shakthi, at this temple. Just north of where this temple stands, there are two “holy rocks” in the sea, about half-a-kilo meter from the north coast of Nainativu, which are related to a legend that is part of the traditional history of this temple. One is called “the Rock of the Sea Eagle” (Garudan Kal) and the other is known as “the Rock around which the Snake wound itself” (Paambu Sutriya Kal). It is believed that, many centuries ago, a cobra was swimming across the sea towards Nainativu from the nearby island of Puliyantivu with a flower on its mouth, for worship at the Nainativu Nagapooshani Amman temple. A sea-eagle spotted the snake and was trying to attack it and kill it. Fearing harm from the sea-eagle, the snake wound itself around a rock in the sea about half a kilo-meter from the Nainativu coast, and the sea-eagle stood on another rock some distance away. A merchant from the Chola kingdom who was himself a devotee of Sri Nagapooshani Amman, and who was sailing at that time on his ship close to the said rocks noticed the bird and the snake. He pleaded with the bird to let the snake go on its way without any harm. The bird agreed on condition that the merchant should construct a beautiful temple for Sri Nagapooshani Amman on the Nainativu island. He agreed and built a beautiful temple accordingly. Presently, millions of devotees throng this temple annually for worship from all over the world. 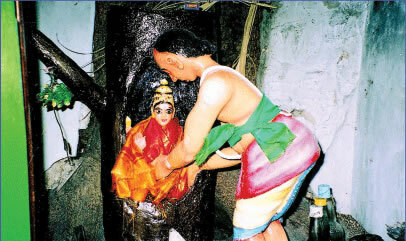 Nagapooshani Amman (Our Lady who is worshipped by Serpent) is the presiding deity at this temple. Many parents who have been childless for several years, including some who are non-Hindus, seek and receive the blessings of Nagapooshani Amman at this temple. It is a daily occurrence at this temple that such blessed parents bring their babies and fulfill their vows at the temple. Tiny images of babies and cradles, made in gold or silver, are mainly the objects gifted to this temple by such devotees. The annual high festivals of the temple are held in the Tamil month of Aani (mid-June to mid-July) for sixteen days. Any person who knows something about this temple and its annual high festivals would not want to miss the colorful chariot festival on the fourteenth day, if that person is going to be around in northern Sri Lanka in June-July. More than one hundred thousand pilgrims go to Nainativu for the chariot festival. At the central bus stand (or bus station) in the city of Jaffna, take the bus (Route 776) to Kurikadduvan. Kurikadduvan is a point from where passenger launches ply to Nainativu and back. 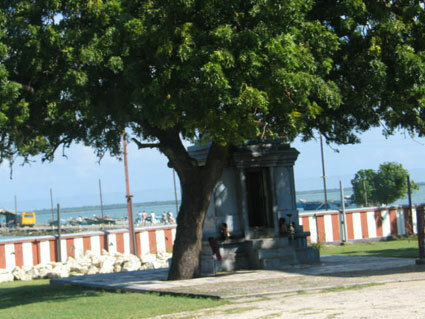 (Kurikadduvan is located on the island of Punkudutivu which is connected to Jaffna by causeways). The bus trip from Jaffna to Kurikadduvan would take approximately one hour. The last launch to Nainativu for the day would leave usually at 6:00 p.m. from the Kurikadduvan jetty. If you are planning to return to the city of Jaffna on the same day, you should start early in the morning from Jaffna, and make sure you are at the Kurikadduvan jetty (or pier) by 10:00 a.m., the latest. For those who would want to participate at the noon poojas (prayers) of the Nagapooshani Amman Temple, I would advise that they should be at the Kurikadduvan jetty before 9:00 a.m., as there could be a long delay sometimes due to overcrowding. The launch trip to Nainativu would take about 15 minutes. On approaching Nainativu, your launch may, first proceed to a jetty opposite the Buddhist temple if there are any Buddhist pilgrims on your launch. Pilgrims to the Buddhist temple would get off the launch at that jetty. Thereafter, your launch would proceed to the jetty opposite the Nagapooshani Amman Kovil which would be the final destination for the launch, and the remaining passengers on your launch would get off there. சென்னை: தமிழகத்தில் தர்மபுரி மக்களவை மற்றும் பூந்தமல்லி சட்டப்பேரவை தொகுதிகளில் கள்ள ஓட்டுகள் போடப்பட்டதாக புகார்கள் எழுந்துள்ளன.